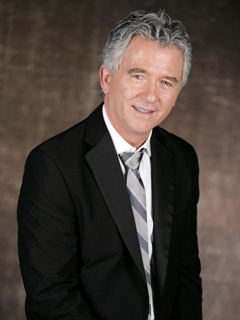 Patrick Duffy starred in several series, including MAN FROM ATLANTIS (as Mark), STEP BY STEP (as Frank) and of course, the prime-time soap he’s most known for, DALLAS (as Bobby). But even without these shows on his resumé, the star has had an incredibly successful career, having appeared on dozens of popular TV shows and TV movies. Duffy was not raised in a showbiz family. His parents, Terrence and Marie Duffy owned taverns and a young Duffy actually wanted to become a professional athlete. However, he fell in love with acting in high school and was one of only12 students accepted to the Professional Actors Training Program at the University of Washington, Seattle. In the late ’70s, Duffy’s career began to really take off. From 1977-78, he played the lead in MAN FROM ATLANTIS; almost immediately after, he won the life-changing role of Bobby in DALLAS. It didn’t take long for DALLAS to become a hit. Meantime, Duffy continued to appear in series such as THE LOVE BOAT and HOTEL, and in TV movies, including CRY FOR THE STRANGERS and FROM HERE TO MATERNITY. In 1985, Duffy left DALLAS and his character was killed off; however, at the end of the next season, Bobby turned up alive, and in one of TV’s most surprising scenes ever, revealed that the past year had been Pam’s dream! The actor was dealt a serious blow when in 1986, his parents were murdered when teenagers raided their tavern. Still, Duffy pressed on and continued to do DALLAS, as well as TV movies and guest spots. Duffy stayed with DALLAS until its end in1991 and continued to star in the various DALLAS TV movies over the years. He’s even signed on to appear in the remake in 2013. But in addition to DALLAS, he had plenty of projects in the ’90s; he then starred opposite Suzanne Somers in the hit sitcom STEP BY STEP from 1991-98. After STEP ended, Duffy did more guest spots on REBA and TOUCHED BY AN ANGEL. Then in 2006, he signed on to be a recast for B&B’s Stephen Logan, previously played by Robert Pine. Duffy fit right in as the father to Brooke, Katie and Donna. This past year, his character romanced Stephanie’s sister, Pam, giving Duffy a chance to work with his longtime friend, Pam’s portrayer, Alley Mills. Has been a Buddhist since 1972. Could hold his breath underwater for three minutes during his MAN FROM ATLANTIS days. His wife, Carlyn, was the one who came up with the "Pam's dream" reveal on DALLAS. His son Connor Duffy played Little J.R. on the final episode of DALLAS in 1991. Meanwhile, his other son, Padraic, played Mark Harris on DALLAS from 1990-91. TNT plans to launch a new version of the hit primetime soap DALLAS this fall. The series, which previously aired on CBS from 1978 to 1991, will now focus on "the offspring of bitter rivals and brothers J.R. and Bobby Ewing," according to show reps. He was the MAN FROM ATLANTIS and DALLAS' Bobby Ewing, and now Patrick Duffy (Stephen, BOLD AND BEAUTIFUL) is mighty crabby...thanks to his hit Web series, PATRICK DUFFY AND THE CRAB! The veteran actor talks about how the hilarious project is "Leisure" time.